Chris Samnee: Post #701, now with body modification! Wow, I just realized that yesterday was my 700th blog post. Yeesh! Okay, so while my head is still swollen from San Diego, and that 700th post accomplishment, how 'bout we celebrate with a photo instead of a sketch today? 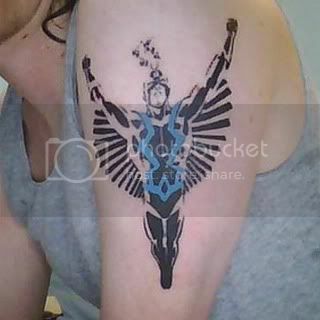 This shot of Black Bolt is, at least to my knowledge, the first time anyone has had needles and ink repeatedly poked into their skin using one of my drawings as inspiration. Thanks, Pat! Love Black Bolt!! Very Cool. As Alan said, "What a tribute!" Like Black Bolt, I'm speechless! That is really going to annoy Edd. Happy 701, here hoping you get to 1402 and even higher!